This is #10 in our series of #TIPS intended to help you manage fraud, embezzlement, waste, abuse; and help keep your practice safe. This post discusses some of the red-flags of employee dishonesty and how to interpret and evaluate them. A “red-flag” is an indicator of a circumstance that varies from “normal”. It shows that something is out of the ordinary and may need to be investigated further. 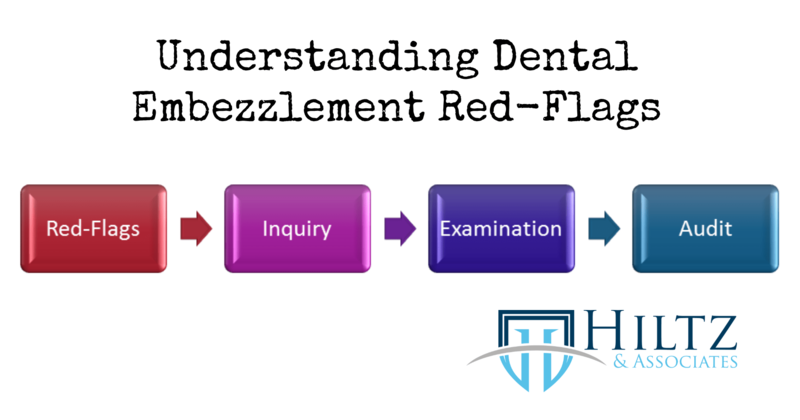 Many embezzlement red-flags are common to all types of business, while others are specific to dentistry. An embezzlement red-flag is simply a warning sign. A probability that the red flag observed is the result of employee dishonesty. Red-flags are NOT EVIDENCE that theft has occurred. Fraud experts say that in 40% of embezzlement cases reported, the person stealing displayed a living standard disproportionate to their income. I think of it this way. If you observe your employee living beyond their means, and see no reasonable explanation for it, then there is a 40% chance the employee is stealing from you, and a 60% chance they are not. Fraud experts say that in 20% of embezzlement cases, the perpetrator displayed “control issues”, or a willingness to share duties. If you have an employee like this, there is a 20% chance that the behavior is a result the employee’s strong desire to “keep control” (of things like the practice software and practice accounting) for fear that you will uncover the theft. Conversely, there’s an 80% chance that the employee’s behavior is linked to something else. Maybe the employee is OCD, or trying to conceal sloppy work, or hiding an unfavorable practice statistic that will reflect poorly on their performance. Some of the most commonly reported red-flags reported are listed below. The “Top 6” red flags are shown in red. As a group these red-flags are present in 85% of embezzlement cases. What to do when you have red-flags in your practice. The image below is process I use when assessing a red-flag, and each of the other steps taken up to a forensic audit. When you identify one or more red flags in your practice, the first step is skepticism. This is where you apply reason, logic and common sense. Don’t jump to conclusions. It is best to respond than to react. For every red flag that you observe, consider alternate explanations and the likelihood of each explanation. If your employee is clearly living beyond their means and the alternative explanation is they had a “big win” at the casino – consider the extreme odds. However, if the explanation is a modest inheritance or a second family income, then the odds are more realistic that this happened, and likely can be verified. When you assess each red-flag, consider the “weight” of your response. Dentist B answered yes based on a conversation overheard 9 months ago where the employee was complaining to a co-worker about being late with her last car payment. Both dentists answered YES, however intuition tells us that Dentist A should be more concerned than Dentist B. If skeptical and careful reasoning does not reduce or absolve the red-flags you have identified, the next step is inquiry. For each red-flag, ask yourself what other identifiable sources of information can be used to corroborate the red-flag? For example: If you are concerned because your employee is the first to arrive and last to leave the each day (or comes in after hours to do work), then you can inquire further by checking your building alarm system and computer audit logs. Most practices have an alarm system to that must be disabled when you enter, and enabled when you leave. Therefore, checking your building alarm log can be revealing. You can also run an “audit report” from your practice management software to look for events that occur outside normal business hours. If the inquiry does not remove your concerns, or serves to bolster them, move to the examination step. A fraud and embezzlement examination is performed by a specialist and comprises of a targeted and exploratory analysis of the practice’s computer data and business records to look for and identify evidence of fraud or embezzlement. If theft is uncovered, the examination will confirm, verify and estimate its scope. As well, the examination will provide the dentist or practice owner with evidence of theft, and an estimate of its impact and duration. This evidence can be used to terminate the perpetrator’s employment on a “for cause” basis, if they are still employed by the practice, and so the dentists can make an informed choice regarding the next step. In many cases, an examination will provide sufficient evidence to support a claim against the practice’s employee dishonesty insurance policy. A forensic audit is a comprehensive reconstruction of the events leading up to and resulting in theft. This level of work is generally recommended for civil and criminal prosecution and recovery purposes. This type of work is also indicated for litigation support purposes.